ELASTIC BED SHEET STRAPS - Made of high quality 1" wide elastic band and clips to fit different types of bed sheets, fitted sheets, flat sheets, mattress pads etc. The strong elastic strap provides secure and stronger grip for heavy duty purpose. No more loose sheets in the morning! 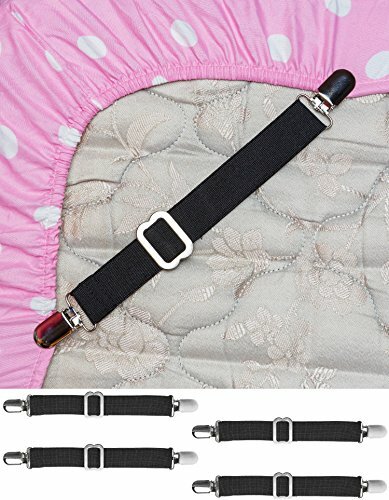 QUALITY ADJUSTABLE METAL BUCKLE - The adjustable buckle enables you to lengthen or shorten the sheet grippers depending on your use, from 8.3" to a maximum of 13". Use it to secure other sheets such as your ironing board covers, mattress covers, cushion covers, seats and more! EASY PUT ON - Easy to put and keeps corners in place with minimal effort. Simply secure the 4 pieces of the bed sheet fasteners to the 4 corners of your mattress sheet. Slide it underneath the mattress, adjust the buckle for greater tension and firmly secure the 4 corners. Avoid the hassle of lifting heavy mattresses up or flipping it around! HIGH QUALITY ELASTIC BAND & GRIPPER CLIPS - Made of sturdy chrome metal clips and heavy duty elastic cords, they will surely hold your bed sheets tightly, preventing any loose corners in the morning. The built-in clenching system is made of plastic to protect your fabric from damage or tearing. Rubber Tucker Sheet Holder Band – Unique New Concept for Securing Bedding. - No More Untucked Sheets! - No Clips, Grippers, Suspenders Or Fasteners - Large Mattress Band for King Mattress.